A former prison in the heart of Potsdam, Brandenburg, Germany, that was used successively by the Nazis, the Soviets/KGB and then for more than two decades and a half the Stasi in the GDR. Turned into a memorial space after the German Peaceful Revolution of 1989 and the country's reunification, it is now one of the visually most stunning dark sites in Potsdam. More background info: The building on Lindenstraße 54/55 dates back to the 18th century. It was built during the reign of King Frederick William the First of Prussia in the Dutch red-brick style that was fashionable at that time. It was a city palace used by the military. Later, during the French occupation by Napoleon's troops, the site was used as a storage facility and – I'm not making this up! – as a hospital for horses! In the early 19th century the building took on a political/administrative role, namely as the home of the assembly of city deputies (“Stadtverordnetenversammlung”), the local Potsdam parliament of sorts. It wasn't until 1820 that the building first became a court of justice and remand prison, giving rise to extensive rebuilding of both the main house (which became the court) and the buildings at the back surrounding the courtyard, which became the prison. The cell blocks were gradually extended and the complex as we see it today was finished in 1910. But its real dark days began with the Third Reich. From 1935 to 1940 a so-called “Erbgesundheitsgericht” (roughly 'hereditary health court') was set up here, which implemented racial laws the Nazis had passed. These laws, based on the twisted theories of 'eugenics', led to plenty of cases of enforced sterilizations (see also under Schloss Hartheim). The prison part of the site, meanwhile, became one of the many places where the Nazis incarcerated political prisoners right up until the end of WWII and the collapse of the Third Reich. But that was not the end of the dark times for this particular place. Quite the contrary. In the summer of 1945 the prison building was seized by the Soviet authorities who then used it for their own kind of persecution and atrocities. The NKVD, and subsequently the KGB, first went after real or alleged (former) Nazis who had been complicit in war crimes or who were accused of being part of the alleged Nazi underground resistance organisation “werewolves” (most of those arrested and tried, often just teenagers, were quite innocent, though). But soon the KGB shifted their attention to anyone who seemed to be critical of the new communist regime or was alleged to have been a spy for the West. Many were tortured to obtain “confessions”, tried by tribunals without any defence and then either sentenced to death or sent to gulags. The same happened at the KGB's very own prison at Leistikowstraße in the Soviet “forbidden town” in the north of Potsdam. But while the latter carried on targeting mainly Soviet deserters, the Lindenstraße prison was, in 1952, handed over to the newly formed Stasi, the GDR's very own secret police (see Stasi Museum). 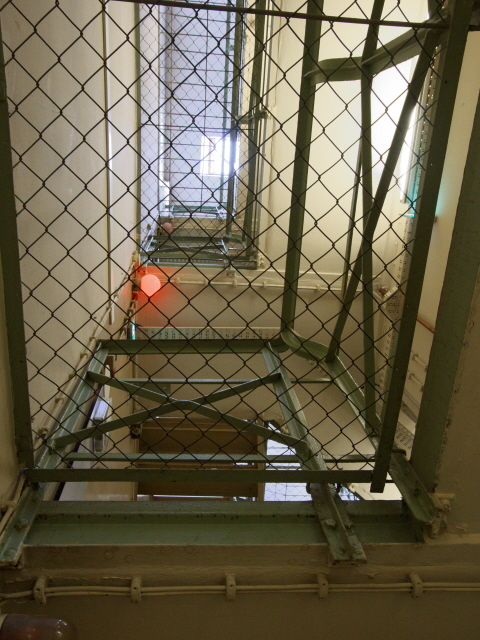 For the next 37 years, the Stasi would use the place as a remand prison, and some 7000 political prisoners are estimated to have gone through this ordeal here (cf. also Hohenschönhausen, Bautzen, and Bautzner Straße, Dresden). What was going on inside was well hidden from the general public (you can't see the cell blocks from the road and the entrance was cordoned off). Yet the place soon acquired the cynical nickname “Lindenhotel” (cf. “Hanoi Hilton”!). After the Peaceful Revolution in the GDR had led to the fall of the Berlin Wall and the dissolution of the Stasi was imminent, all remaining prisoners were released. On 5 December 1989, protesters stormed the Stasi HQs in Potsdam (as they also did elsewhere – cf. for instance Runde Ecke in Leipzig) and also the Lindenstraße prison complex. But by then the local Stasi had managed to destroy almost all files, except for the prisoners' register. After the prison was closed, the main building on Lindenstraße was from January 1990 declared a “house of democracy”, with newly formed political parties using the rooms for their offices in the run-up to the first ever free elections in the GDR, which were held in March 1990. The prison was preserved as a historical site and declared a memorial in 1995. The current permanent exhibition was opened in 2010. What there is to see: From the street level outside the prison you'd never think that anything so sinister could be behind these rather pretty walls. The only slight indication that this may not be a “normal” house is the fact that the windows at ground level are barred (though that alone doesn't have to mean anything – there are lots of other buildings too that are secured in that way without having anything to do with imprisonment). It could be just like any other of Potsdam's grand edifices. But once inside and at the ticket and information desk you get the first few glimpses through the windows into the courtyard and see the towering, sinister façades of the barred-window cell blocks. The prescribed route through the commodified parts of the building with its different exhibitions, however, begins in the old front building. For orientation you are given a fold-out plan that outlines which parts of the buildings and the exhibitions pertain to which parts of its history. Throughout the various corridors you can find boxes with more of these, in case you lose your original copy (very thoughtful!). NOTE that all written texts as well as all audiovisual material is in German only. So if you don't have a fairly good grasp of the language you'll miss out on the information and personal stories. If you want these, then maybe you should consider arranging a guided tour (see below). But even without the information, you can still get a lot out of this place, not so much the individual exhibition rooms, but from the original architecture and general oppressive atmosphere in the cell blocks. Some of the info is enhanced by artefacts and/or photos, so you might have a good guess or two at the backgrounds as well here and there. Before you get to the dark phases of the history of this place, however, you first receive a bit of prehistory, as it were, mainly about its uses before it became a prison. Also still in the old court house/administrative part you can see a couple of GDR-era relics. One is the former reception room near the entrance that has been left furnished as it was back then. The other is a reconstructed interrogation room, complete with a tape recorder, an ashtray and a pack of cigarettes (those were the days, of course, when both Stasi interrogator and inmate interrogatee would puff away during the interviewing …). You can listen to an audio recording of an actual interrogation from 1989. Then follows a section, still in the old front building, about the Nazi period in Potsdam, and in particular the use of this place as a 'court of racial hygiene' and the topic of enforced sterilizations (which victims have never been compensated for, neither in the East nor in the West!). You then enter the actual cell blocks at the ground floor level. The first ten cells contain individual aspects and personal stories still from that period of the Third Reich, mostly in the form of text-and-photo panels on the wall, occasionally accompanied with additional audio recordings you can listen to on headphones, but there's also the first of a series of audiovisual stations with a video screen playing an interview with a survivor. The personal stories vary greatly in nature, but all of them convey the utter disregard for humanity displayed by the Nazis. The next big thematic block covers the period of 1945 to 1952, when the Soviet NKVD/KGB used the prison to incarcerate and torture its victims. It's getting visually grimmer here, since the cells in this part have not been given the same refurbishment and fresh coat of white paint as the previous ones. Here you still get the original faded greens and browns. The many personal stories are naturally of the grimmest sort too. Even more audio and video stations are positioned here than in the previous section. At the end of this corridor you can take the steps down to the basement level – where you can see some preserved (or reconstructed?) cells from the early NKVD period, i.e. the most basic kind of prison cells imaginable. Just a wooden plank bed and nothing else. One of the original cell doors has “25 years” scratched into it by one of the prisoners – that would have been the sentence. Many of those condemned to forced labour were sent to the gulag of Vorkuta in northern Russia. On display are also a few artefacts from that gulag, such as felt boots and a woolly hat. Back at ground level you can use a side entrance for a brief excursion into the courtyards. Here you can see the garages (with one typical Stasi prisoner transport van on display), one of the open-air exercise cells and a memorial sculpture in the northern, larger courtyard. Moreover you get a good visual impression of the whole prison architecture, including searchlights at the top of the walls, barbed wire and spiky barriers and all. On the fourth floor of the central cell block I spotted an odd juxtaposition with all those grim elements: windows that looked like stained glass, as in a chapel! On my way out I asked the museum warden on duty at the ticket desk and he confirmed this. However, this chapel is not publicly accessible. The exhibition only goes as far up as the second floor. The chapel is now just used as a storage room. The circuit then continues up the southern main staircase to get you to the first floor. Here the exhibition carries on with a detailed look at the longest period in the prison's history – that as a Stasi remand prison in the GDR. Panels provide an overview about the structure, hierarchies and inner workings of the Stasi as well as its methods (for all this see also under Stasi Museum Berlin or Runde Ecke in Leipzig!). You can see a reconstructed “Effektenkammer” (storage room for inmates' personal belongings, all of which they had to forfeit for the duration of their imprisonment), prisoners' clothes, as well as a photo booth with a rotatable chair for taking mugshots (portrait, left and right) of new arrivals. There's also a staff room still furnished in that stuffy old GDR interior design of the 60s and 70s, as well as different cells from different periods. Interspersed are, yet again, various personal stories, partly in written form, partly in audio/visual form. Running along the walls was also an emergency wire with which the guards could have triggered an alarm at any point. Also note the fact that all the toilet cisterns are outside the cells along the corridor walls. This was presumably so in order to avoid having any overhead pipes inside the cells, which desperate inmates could have used to hang themselves from. At the end of the corridor on this level you come back to a part of the front building facing Lindenstraße, and in two of the larger rooms here is an additional exhibition covering the topic of the Peaceful Revolution in the GDR in 1989/90 that led to the fall of the Berlin Wall, the collapse of the Eastern Bloc and the eventual reunification of Germany. While that section is still part of the permanent exhibition there was at the time of my visit (April 2017) also a special temporary exhibition on. This was a photo exhibition showing images of the brutal crushing of the protests in Gwangju in South Korea in 1980 by the military dictatorship there. In this exhibition, the texts commenting on the photos did come with English translations. But by the time you read this, though, this particular temporary exhibition will long have finished. Whether all temporary exhibitions are bilingual I cannot say. Carrying on with the regular permanent exhibition you then make your way to the second floor. The first few cells on this level are left empty – and at the time of my visit the only commodification were projections of quotes – in English! I wasn't sure whether that was still related to the temporary exhibition or actually part of the regular museum design here. It was rather odd in any case. Also on this floor is yet another GDR-era staff room with the typical interior design and furniture, including a MuFuTi, which is short for “Multifunktionstisch” ('multi-functional table'), i.e. a special table that can be extended and adjusted in height. (They also existed in the West, but “Mufuti” was the special GDR jargon for this – as featured in the movie “Sonnenallee”). Amongst the 1970s lamps on this table lie various folders with extra information on individual cases. Some of these – breaking the otherwise consistent monolingual nature of the exhibition – are marked “English”. Further down the corridor you come to a washroom as well as a “Strafzelle” or 'punishment cell' for inmates who had broken the prison rules. This was a special cell that was subdivided by bars into a sanitary, a sleeping and a day area. The latter had no furniture, i.e. victims had to spend the day standing and were not free to go to the toilet as and when they wished. The cell was also darkened for most of the time. 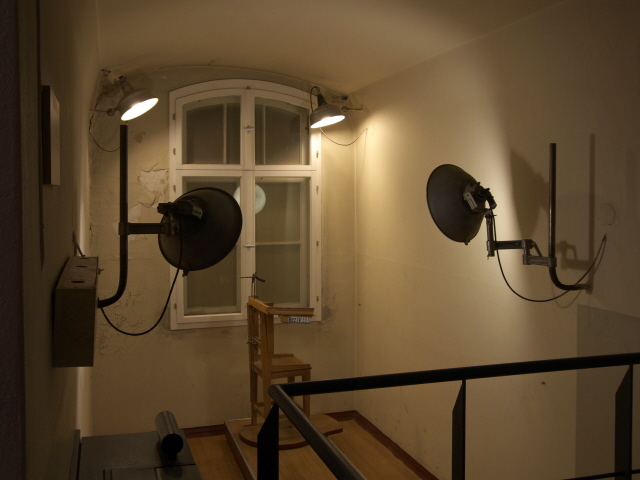 More cells are reconstructed to look like they did in the early phases of the 1950s/60s – i.e. almost as Spartan as the KGB-era basement cells – as well as in later phases when proper toilets and washbasins were installed and the plank beds had bedding and blankets. Then you make your way back to the main staircase and down to the exit. Optionally you could have another look around the courtyards before leaving. All in all, this is one of the visually most stunning ex-prisons I have ever visited. And it's worth visiting for that alone, even if you do not understand German enough to make use of the information panels and audiovisual material. But if you do you also get an incredibly comprehensive impression of what went on in this place during the three authoritarian phases of the Nazi period, the Soviet occupation and all through the GDR era. Particularly moving are many of the personal stories portrayed at all stages of these phases. Highly recommended! It's a shame that none of the texts come with translations into English (or other languages) and that the videos do not have subtitles. International visitors thus have to miss out on all this – or have to arrange a guided tour. However, that may well change in the future. There's a general trend in Germany to make more and more memorial museums at least bilingual. So it may come to this place at some point too. Location: right in the very heart of the Old Town of Potsdam. The address is Lindenstraße 54/55, 14467 Potsdam, Brandenburg, Germany. Access and costs: easy to get to; cheap. Details: thanks to its very central location, the site couldn't be much easier to get to. From within central Potsdam it's comfortably walkable. The ex-prison is just steps from Potsdam's central pedestrianized tourist street Brandenburger Straße, on the block going up to Gutenbergstraße. If you need public transport, e.g. if you're coming from the central station (and Berlin), then tram line 91 gets you the closest, namely to the stop Dortusstraße a block south of Brandenburger Straße. Opening times: Tuesday to Sunday from 10 a.m. to 6 p.m.; closed Mondays. Admission: a mere 2 EUR (concession 1EUR). Regular guided tours (in German) take place every Saturday at 2 p.m.; you can also book special guided tours for groups (3 EUR per person, for groups under 10 participants a flat rate of 30 EUR is charged), and these can also be done in English or French (contact: fuehrungen(at)gedenkstaette-lindenstrasse.de). That may well be worth considering, since the exhibition parts of the site are almost entirely in German only! Time required: quite a lot, especially if you can read German, in which case you'll need a minimum of two hours, quite possibly longer. If you can't read German and mainly come for the visual impressions, you should still allocate an hour or so just for exploring the site. Guided tours last ca. 90 minutes, up to an hour longer if they include talks with an eyewitness (i.e. former inmates). Combinations with other dark destinations: see under Potsdam. There is another prison memorial site in Potsdam, in its northern suburb Nauener Vorstadt, which was a KGB remand prison until the Soviets departed. And unlike the Stasi prison memorial at Lindenstraße, this one at Leistikowstraße is also commodified for international guests (most is bilingual, in German and English, and much of it also in Russian!). Combinations with non-dark destinations: some of Potsdam's prime mainstream tourism attractions are quite nearby! The main pedestrianized street (Brandenburger Straße) with all the usual souvenir shops, touristy restaurants and fast-food joints is literally just round the corner to the south. Furthermore there's the Dutch quarter a short distance to the east, the Jägertor a mere few steps to the north, the Brandenburg Gate (yes, Potsdam has one too, not just Berlin) to the west and also the vast complex of the World Heritage Site of Sanssouci just a short walk further west still.